Well, I'd seen it on TV. Having enjoyed "The Angel's Share" I knew that various locations had been employed in creating Loach's enjoyable whisky romp (e.g. Glengoyne, Deanston), and here we were, at Balblair. Nestling in a dip, surrounded by gentle, undulating hills, pocked with sheep, this picture book distillery sits next to a railway line like a non animated Thomas the Tank engine set. I can see it now, the uncensored episode "Thomas takes in a dram or two" in which Thomas, after overindulging in one of Balblair's many wonderful expressions, gets into a ruck with the Fat Controller and finds solace (and his latent sexuality) in the pistons and nutty slack of Hiro, the old Oliver Island (Japanese style) tender engine. What an episode! One of the first things that struck me as our small group gathered in the minimalist reception area was the sense of family that pervaded the atmosphere. It's difficult to pin down how or where that feeling emanates from; it could be the smiles on the faces of the staff, the playful quality of their voices, their relaxed, enthusiastic manner, or the fact that there is, literally, a strong family connection embedded in the personnel at Balblair. Whatever the underpinning reason, it made for a welcoming beginning to our exploration of all things Balblair. ...and then there was John MacDonald! The genial, agreeable master distiller had a whisky twinkle in his eye from the moment we met. I'll be expanding on my views of distillery personnel later but suffice it to say that John affirmed and strengthened my overwhelmingly positive perceptions of distillery staff that I've met. He was interesting and interested in equal measures, honestly sharing his knowledge and passion with our band of eager enthusiasts. We talked yeasts and fermentation times, crops and organics, histories and futures before enjoying some quality local produce (foodstuff not liquid). The tasting & the expressions. 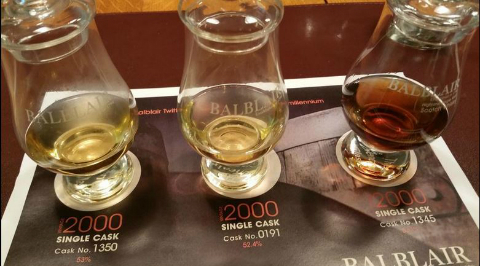 We started off by tasting 3 cask samples from the 2000 vintage to see the breadth of flavour Balblair have across one year. Each of the casks showed the spirit in a different light. Cask 1350 showed the classic Balblair in an ex Bourbon cask (tropical fruit, marsipan, lemon cheesecake and a mineral note) Cask 0191 showed more spice, ginger, orange and a bit of smoke, as the cask used to contain peaty whisky and Cask 1345 showed lovely sherry, Christmas cake notes and rum raisin notes. Each one showed fruity notes, a mineral note and a general freshness, but in different ways. We also tried the Balblair current new make which was malty and very fruity. It reminded me of the tour earlier, particularly smelling the washbacks (such a fruity fermentation, it was almost like an American IPA), then we tried some 1960′s Balblair new make which had fennel notes, oily notes, tangerine, spice, vegetal notes and a brine. Quite a change in style from today’s new spirit. What a fine selection of expressions they were! Whisky in the "schema" of things. By and large we navigate our way through life with the aid of schemas that we have constructed on the basis of how we expect things to be. A schema is the basic building block of intelligent behaviour, a form of organizing information that we use to interpret the things we see, hear, smell, and touch (Singer & Revenson, 1997).When a waiter approaches us in a restaurant we don't immediately think "who's this guy and why is he sticking a list of food into my hands? We have a schema of how waiters behave. When we take a taxi in a busy metropolis we do not generally ask the question "Does he/she know where they are going?" He/she is the taxi driver and we expect them to fulfil our expectations of what a taxi driver does - i.e. Get us to our destination in the best time by the shortest possible route. I can hear you shouting "If only!" And I can attest to some exceptions to this, the most vivid for me being the taxi journey from a Glenfiddich launch event a couple of years back, to Paddington station which culminated in the taxi driver doing a cost benefit analysis in relation to either accepting what I was offering for the journey (£15 less than he was asking) or calling the police (and the time that would take to "deal with" the situation). Whilst this was not a typical experience it allowed me to expand my "taxi driver" schema by including the fact that a minority of them might be dodgy geezers! Consider your ever expanding schema of “whisky/whiskey”. Many years ago it could possibly have been “brown liquid that gets me drunk”, it might have evolved into “well I know there’s whisky and bourbon”, and on to “blends and malts”, and then “well there are Speyside whiskies and Islay whiskies and so on... Many of you reading this will have an extensive whisky schema (that continues to expand in response to innovation and experience). Our schemas expand on the basis of the subtle (and sometimes not so subtle) nuances that we encounter. Not every waiter behaves in the same way, nor do all taxi drivers but they still fit into our general schemas of "waiter" & "taxi driver". When I think of my interactions with the distillery personnel I have encountered I cannot help but feel somewhat wistful. I'm not a seasoned veteran of distillery travel and yet there is a pattern emerging in relation to the people that I have had the pleasure of meeting during such visits. This may come across as an homage, maybe even a little sycophantic but that is not the intention....it is written with respect for the work done by the artisans, the custodians, the whisky men and women on whose watch great whiskies are conceived and nurtured; those many individuals who have a role not only in keeping the spirit alive, but in nurturing it, keeping the momentum, empowering the spirit within the spirit. Not just the master blenders and distillery managers but all of the distillery staff. What is my schema of "distillery personnel"? Well, to date, it's extremely positive. It's as if they inhabit a world free from capitalist clutter. Clearly this is not the case, these are businesses, organisations that operate on the basis of profit and loss, and whose existence is dependent on market forces. However, there are certain characteristics that set them apart from mere business men and women or factory workers. There is an absence of cynicism and artifice (in its negative connotation). There is a deference in relation to the slumbering liquid, a sense of respect that falls short of reverence...but only just! There is good humour, it's almost as if they are in a constant state of pleasant surprise at the rise and rise of "their" glorious liquid. There is a humility that hints at an understanding of their role as custodians of a valued heritage and their place within a long tradition of artisanal creativity; a tradition spanning families, villages, towns, cities, countries and now sitting proudly within a global context. They convey a sense of calm and peace in an environment where a focus on the clock is of the utmost importance. It's as if they have a different relationship with time than other mortals; as if the organic nature of the process wields some ethereal cosmic grip on their psyche. They never appear rushed but simply "in time" with their surroundings. ...and then there's the passion! Their passion permeates the distillery air, enveloping all those that encounter it. Now if you were to ask me which I prefer, someone with an extensive knowledge or someone with passion, I would always choose the latter. Knowledge is something that's acquired relatively easily, you watch, you listen, you read, and you remember. Passion on the other hand, has much deeper roots, it taps into the very essence of who we are, it's located beyond the surface, beyond memory and recall, and it connects us to those things about which we are passionate in a way that simply "knowing" about them cannot. The combination of passion and knowledge is about as infectious as it gets. Those distillery staff that I have met to date are not simply inhabiting the land on which they toil, they are of the land, steeped in, cured in, matured in and married to that all embracing environment in which the glorious liquid is produced. NB. A romanticised account, quite possibly, fanciful, I think not. I'm sure these guys have their "off days" (as do we all), but I've not encountered one yet....and what's wrong with a bit of romance anyway!